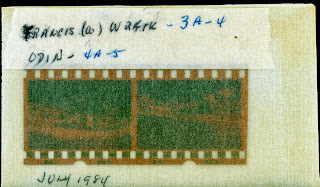 I am in the process of making an inventory of my late Dad's marine negative collection. Dad (Harry McDonald) was a well known "historian" here on the Puget Sound until his passing in the mid-80's. I will be listing the collection, along with several dozen 35mm original slides, on eBay. Watch this space! 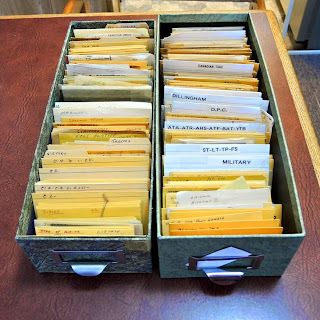 I inherited a massive problem of cataloging his collection, hampered by two obstacles; his hand writing, and lack of documentation. 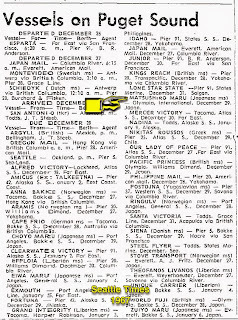 By and by I encountered a negative envelope cryptically marked "UFO May 1967 Alaska." 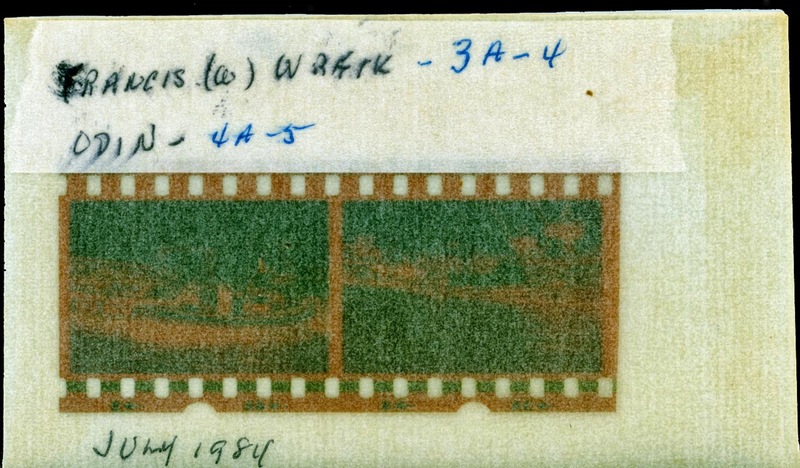 As my Dad was not one who played "games" I dropped the negative into my scanner. 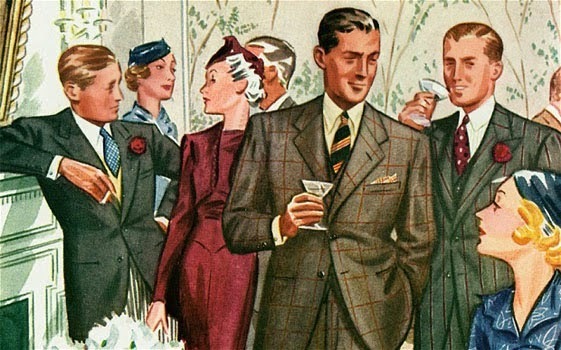 Low and behold this image appeared. And there on the side, "UFO." 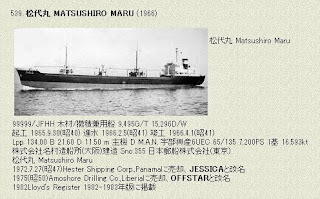 The more I got to studying it, it soon became clear from the rigging, that it was some sort of life saving device. 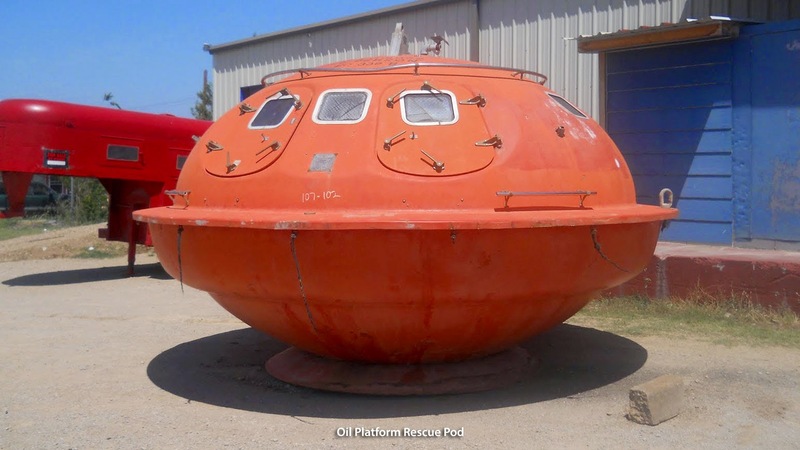 Turning to Google, within moments I discovered this "UFO" was, indeed, an Oil Platform Rescue Pod, a.k.a. 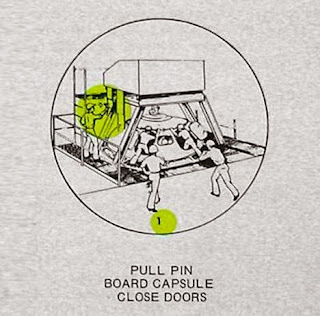 capsule. Furthermore, I found a fellow who had purchased a number of surplus pods, creating an unusual motel with them! 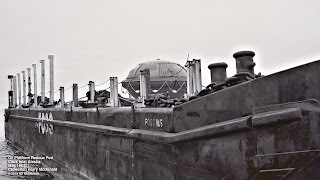 Rescue Pods or Capsules should not be confused with Free Fall Life Boats. Free Fall life boats are outfitted with a motor, allowing them movement, as introduced to the "public" by Tom Hanks - Captain Phillips - on the Maersk Alabama. 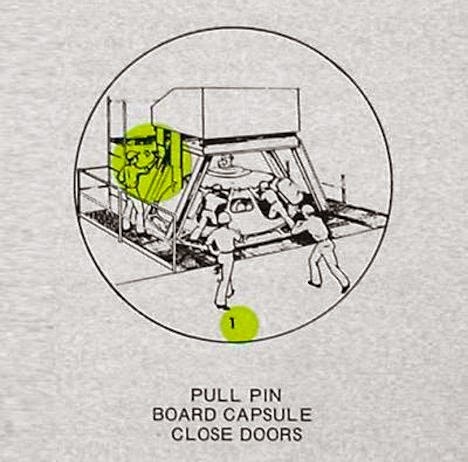 The Rescue Pod was not powered; simply an escape mechanism from a platform emergency. 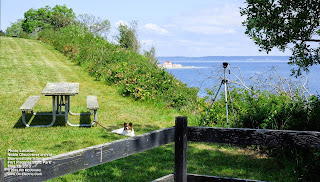 Now the photo my Dad took made sense. 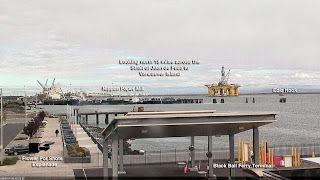 He was working for Foss, involved in towing drill jackets from Kaiser Steel Richmond California to newly developed oil finds in Cook Inlet. And this rescue pod was on a Foss barge, to be delivered to one of several drilling rigs being installed on the Middle Ground Shoal of Cook Inlet in 1964/1967. 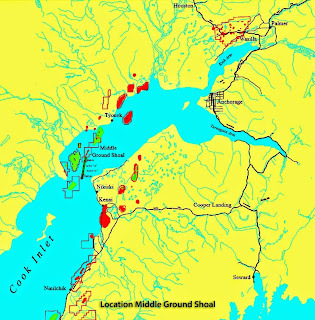 Middle Ground Shoal Oil Field is in the Anchorage Basin, about 52 miles west-southwest of Anchorage, and located centrally in Cook Inlet. 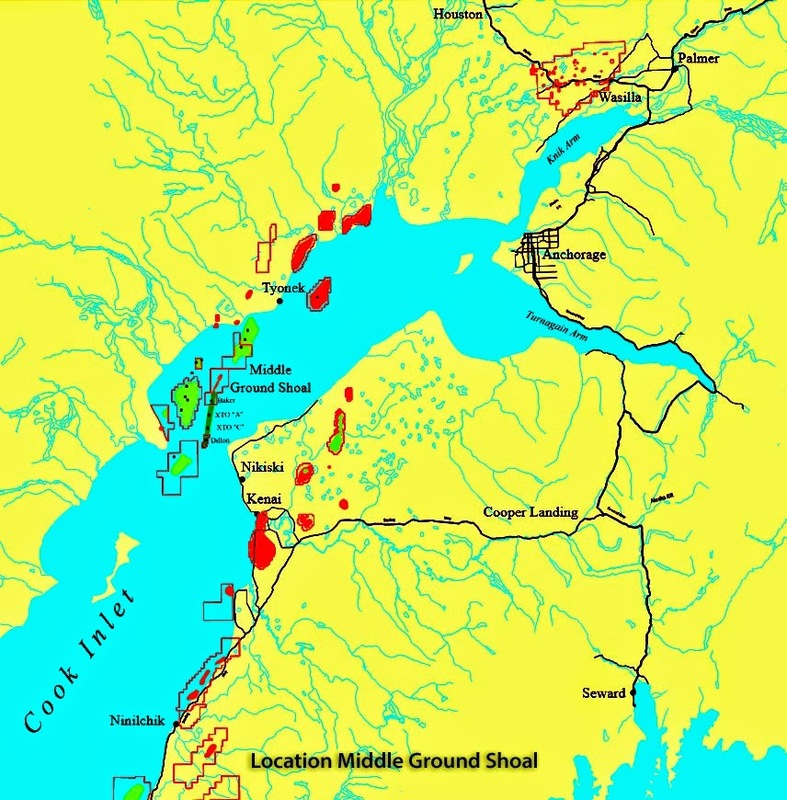 Cook Inlet is probably one of the most difficult marine areas in the world in which to look for and develop oil reserves. 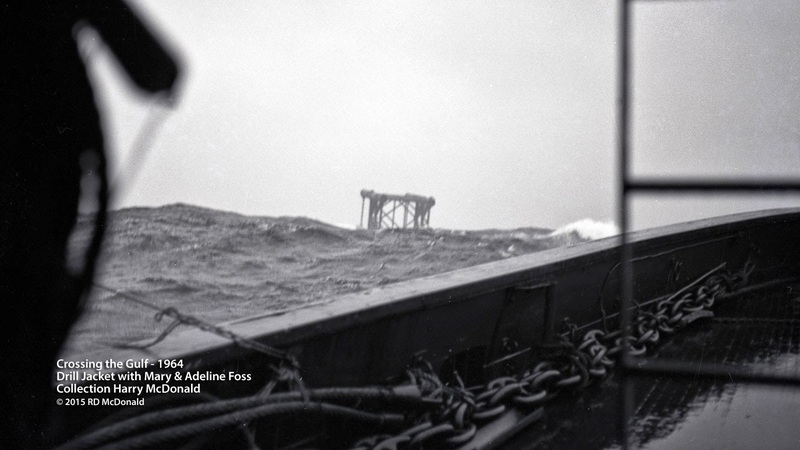 Conditions, such as 25-35-ft tides, 6-8-knot tidal currents, strong winds, and pack ice make all phases of the operation extremely hazardous and tax the ingenuity of the men involved. 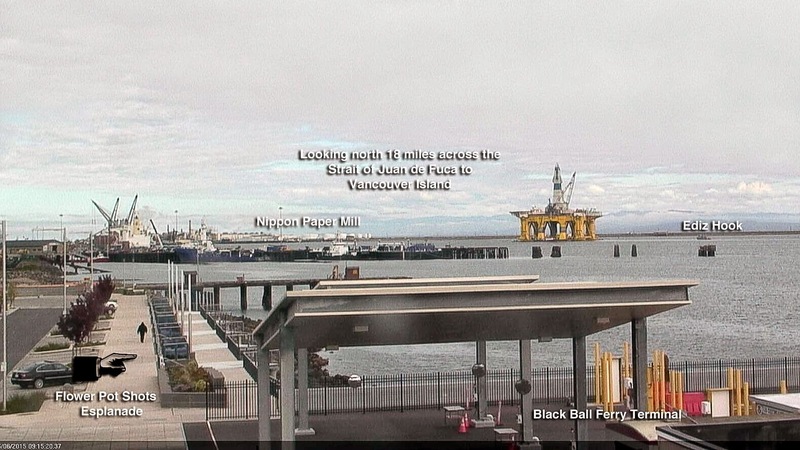 I had a dental appointment over in Seattle last Friday (May 15th) which requires riding the Washington State Ferry system across the Salish Sea, which, when I chat with my sister, I refer to as "the River," a throw-back to 25 years of living in Vancouver Washington, when reference was made to "this side of the river" or "that side of the river." Whenever I catch the 11:55 a.m. ride to Edmond's, I always see the RO-RO Midnight Sun. 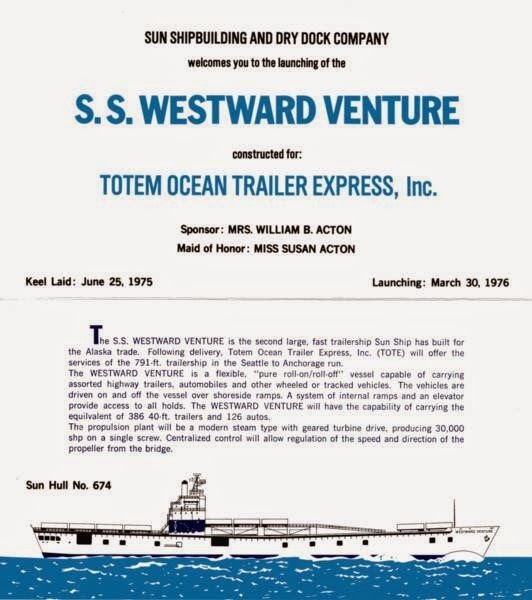 That's because she is operated by Totem Ocean Trailer Express (TOTE). 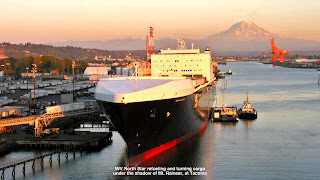 Both she and her identical twin sister RO-RO North Star, provide a proven, reliable conveyor belt between Tacoma, Washington and Anchorage, Alaska, operating on a very disciplined schedule. 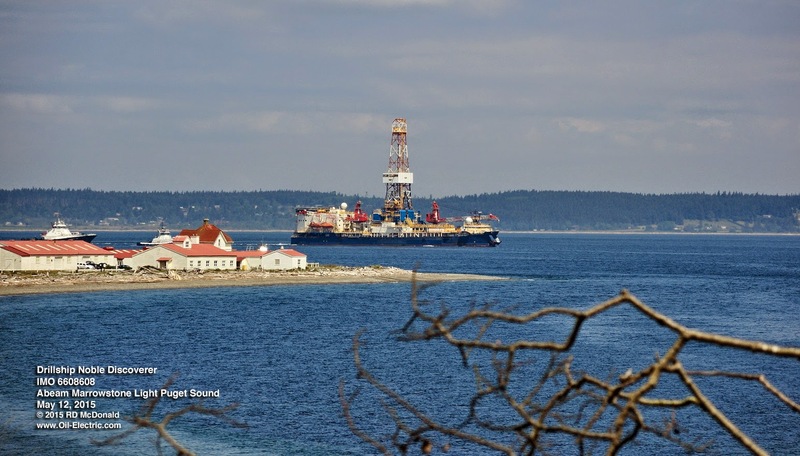 While two rail barge services run to Whittier, Alaska; one from Seattle, the other from Prince Rupert, TOTE caters to truck trailers and motor vehicles - from cars, campers, school buses, and motor homes - in an enclosed environment, free of salt water spray. And quickly! Three day service between the two ports - which may become gnarly in the Winter. 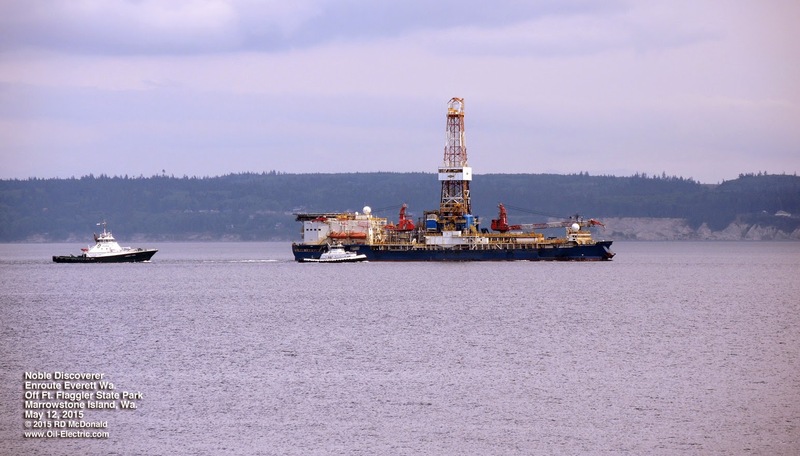 The Gulf of Alaska is very unforgiving. As a young man, I experienced a "blow" on the Gulf which increased our crossing of the Gulf from three days to seven! Motor vehicles can do the Alaska Highway route, such as that provided by Lynden. 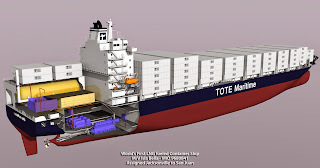 As we learned in the Höegh Osaka incident, one unit of vehicle capacity is known as the CEU (Car Equivalent Unit.) Another method for estimating capacity is LL (Lane Length,) reasonable considering the wide range of motor vehicle lengths, from Mini Coopers to over-sized construction material loads. 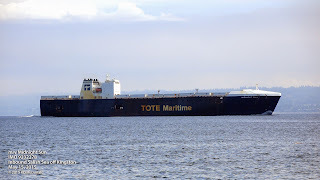 The "official" specifications published by the shipbuilder, states the TOTE Orca Class as 600 FEU plus 200 automobiles. • 1 FEU equals about 25 metric tons (27 st)or 72 cubic meters (2,542 cu ft). Since "day one," Alaska Steamship had been providing passenger service, break-bulk and deck cargo space to Alaska. Oversize loading went by barge, or the long way around on the Alcan Highway. 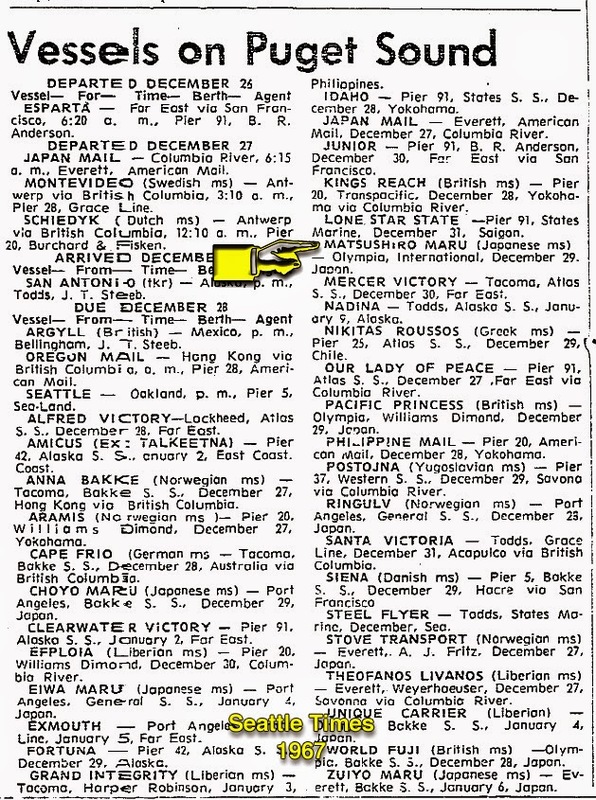 But Alaska Steamship got out of the passenger business in 1954. 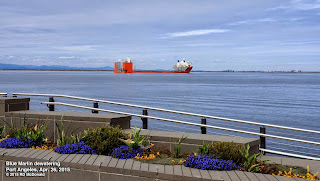 Unable to adapt to the new containerization technologies, Alaska Steamship company shuttered in 1971, creating a vast gap in needed freight services. The gap was filled in September 1975, when TOTE initiated roll-on / roll off ( RO-RO) service to Alaska. 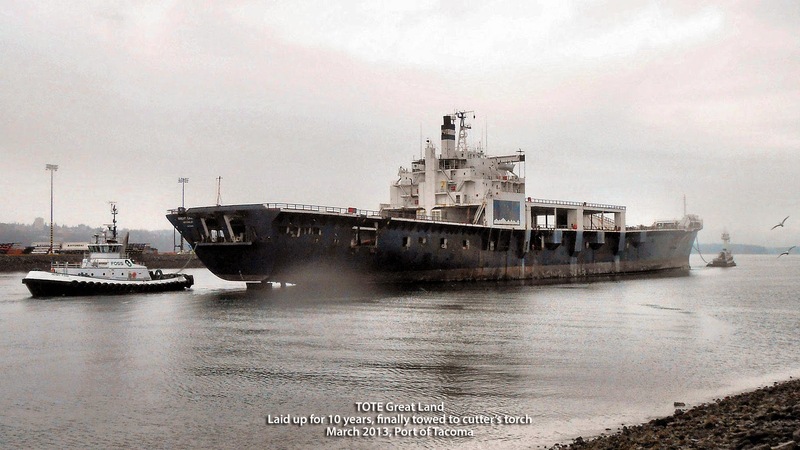 The 790 foot Great Land departed Seattle for Anchorage, with 380 40-foot trailers and 126 motor vehicles. 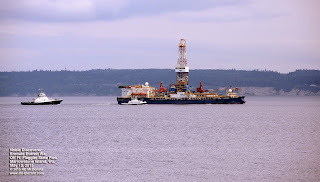 She was soon joined by her sister, the Westward Venture. Great Land service continued until 2003, when TOTE built two new vessels in the Orca Class — the Midnight Sun and North Star. 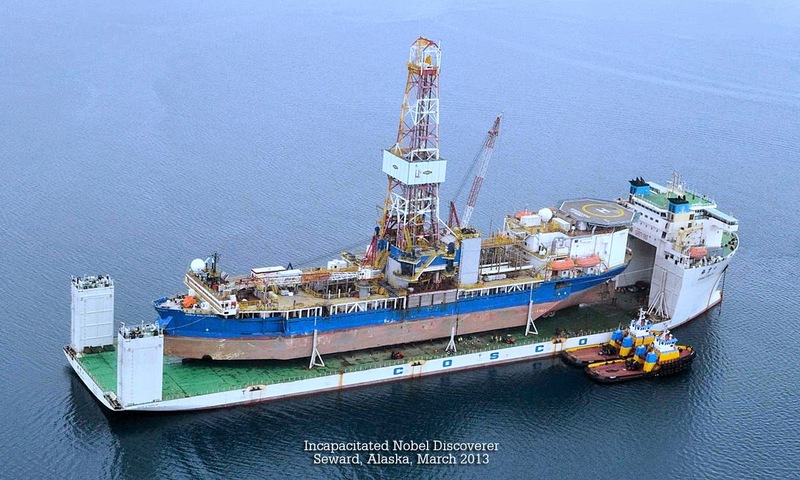 Great Land was mothballed, and eventually went under the cutter's torch. 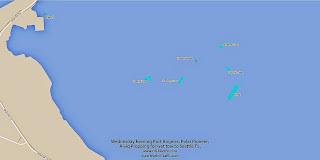 The Westward Venture continued on this route until 2005. 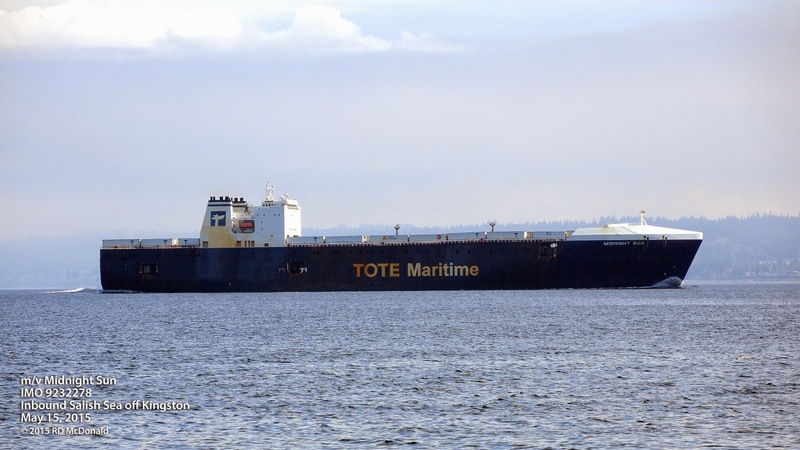 Today, TOTE operates from the Port of Tacoma, and is one of many marine assets controlled by Saltchuk Resources. Thankfully, Saltchuk is "locally" owned, not an extension of some shadowy international conglomerate. 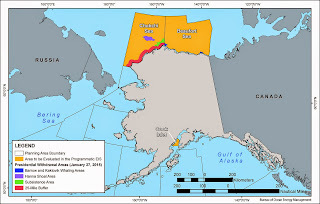 Indeed "Saltchuk" from Chinook, means "saltwater." Not only is Saltchuk a local family owned entity, but American citizens in San Diego, California built the Midnight Sun and North Star! 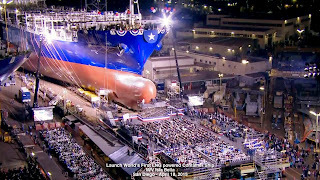 Construction on the first Orca-class ship, the m/v Midnight Sun, began in June 2001 and its christening was August 3, 2002, and delivered in April 2003. 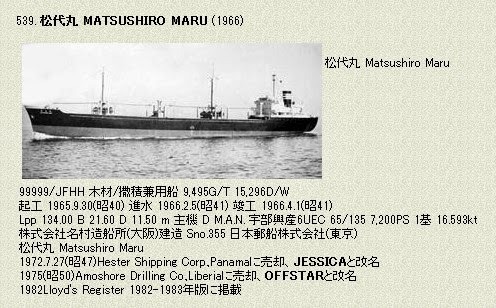 The m/v North Star, was christened on June 14, 2003, and delivered in August 2003. But Wait! There's More Good News! The process of conversion of North Star and Midnight Sun will begin in the fall of 2015. Initially, the two ships will be fueled from an LNG bunker barge, while a shore-based bunkering facility is planned for construction in the Port of Tacoma. So much more good news! 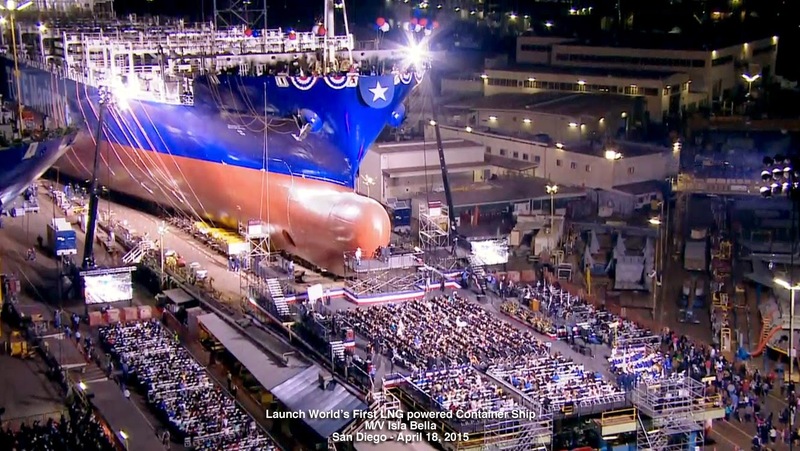 Five weeks ago, on April 18, TOTE launched the worlds first LNG container ship, christened Isla Bella, in a spectacular nighttime launch, complete with fireworks! 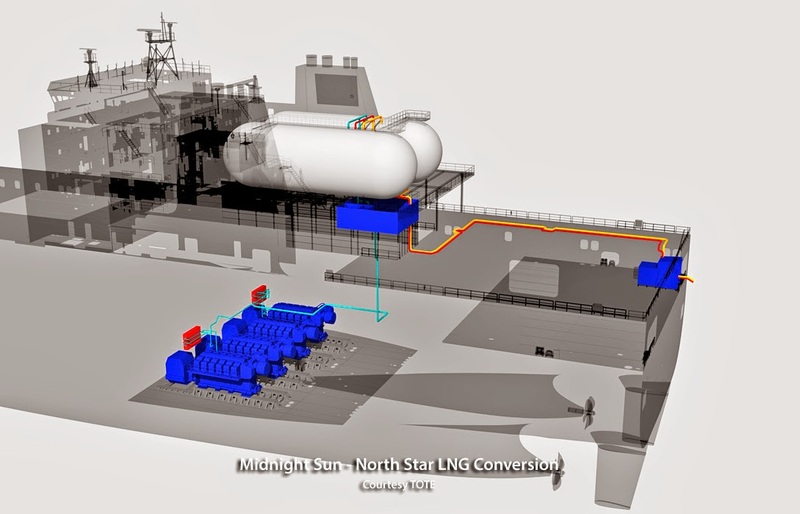 Here is an interesting time lapse video detailing the construction of the LNG tanks. 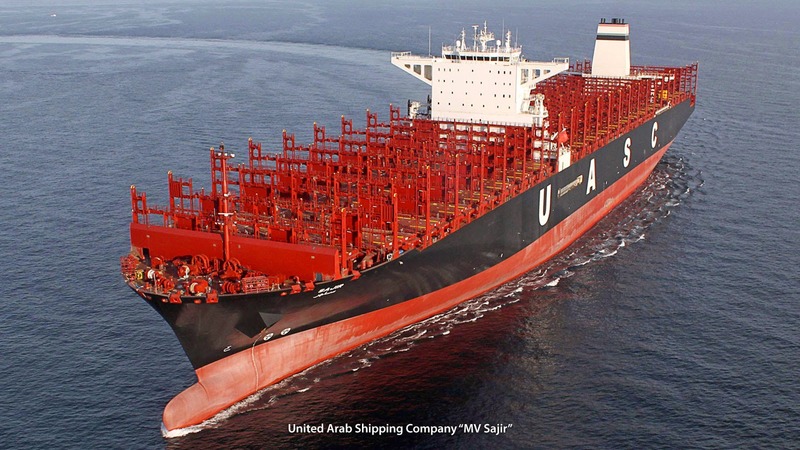 In December, the United Arab Shipping Company (USAC) launched the MV Sajir, 15,000 TEU container ship, advertised as "LNG ready." "LNG ready" which means the vessel has been built with double wall gas piping, a dual-fuel main engine and the space needed for later retrofitting of tanks and regasification equipment so the ship can burn LNG in addition to heavy fuel oil or marine gas oil. It will require down time to switch from bunker fuel to LNG when the time comes, while TOTE's Isla Bella is actually running on LNG. Mrs. Sophie Sacco-wife of Michael Sacco, president of the Seafarers International Union of North America, AFL-CIO-christened the Isla Bella with the traditional champagne bottle break over the ship's hull. 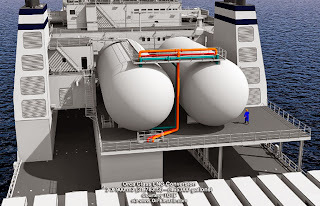 Undoubtedly you've seen hilarious visuals of champagne bottles bouncing off the bow of a vessel or nose of aircraft. Finally, a high tech solution to this embarrassing event. Look carefully at this photo. A bracket with teeth has been welded to the Isla Bella, insuring a decisive bottle smash! 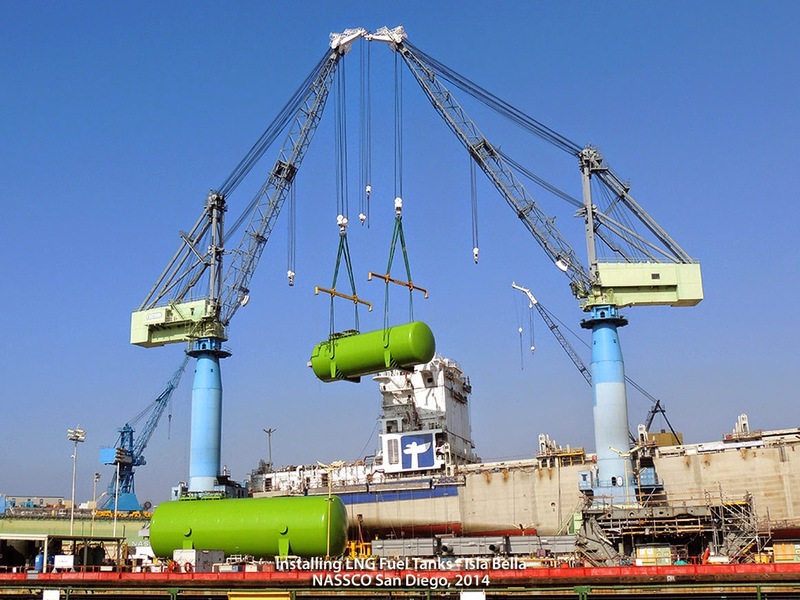 Isla Bella ("Beautiful Island") will be joined by her sister, now under construction at NASSCO, Perla Del Caribe ("Pearl of the Caribbean") in 2016. 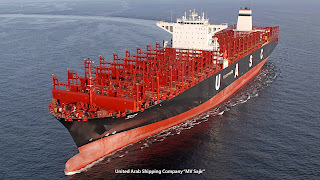 The 3,100 TEU vessels will operate on the Jacksonville Florida - San Juan Puerto Rico service. 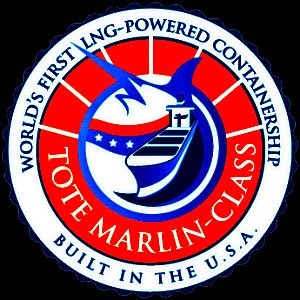 If you spend too much time watching TV, you may have seen this commercial featuring the new TOTE container ship. It is part of the American Natural Gas Alliance (ANGA) "Think About it" campaign. 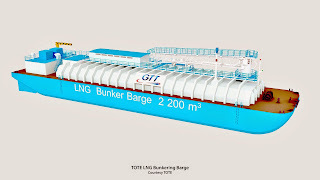 The claim is that by switching to LNG to power the vessel, atmospheric emissions will be reduced by 70%. While that is admirable, informed audiences are rightfully skeptical of propaganda feeding us selected feel good facts about what ever industry cabal they represent. 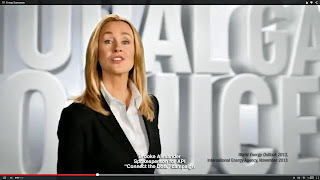 Another example is presented by former beauty queen, former soap opera star, and former Fox reporter, Brooke Alexander, spokesperson for American Petroleum Institute (API), wherein she "Connects the Dots" promoting fracking. And for sure, anyone who has been associated with Roger Ailes is immediately suspect! 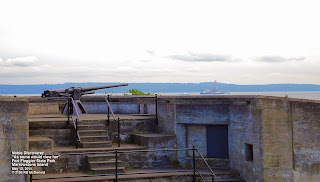 Armed Forces Day or Memorial Day? It's far too easy to fail to understand the difference between the two holidays. 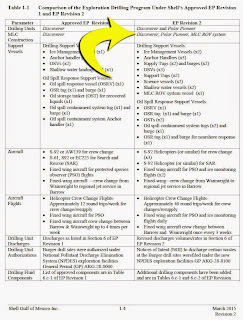 To demonstrate my point, ask a friend or associate if they know the difference between the two. 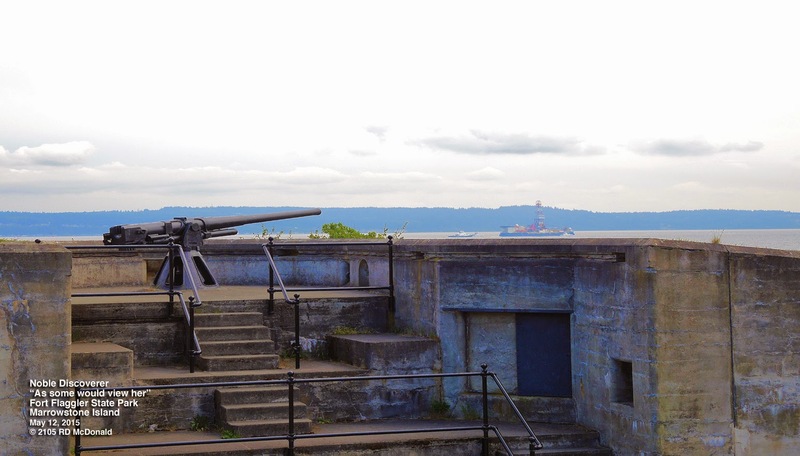 Today is Armed Forces Day, May 16th, whilst Memorial Day is a week away, May 25th. 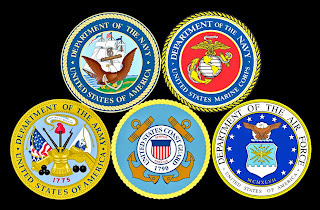 • Armed Forces Day was created in August 1949, to replace separate Army, Navy, Marine Corps, and US Air Force Days. 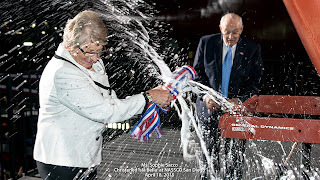 The single day designation also included the US Coast Guard, oldest branch of military; 1790, as a celebration of the unification of the Armed Forces under the Department of Defense (DoD). 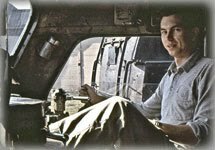 • Memorial Day became a federal holiday in 1971, to honor the men and women who died while serving in the U.S. military. Originally known as Decoration Day, it originated in the years following the Civil War and became an official federal holiday in 1971. So one holiday celebrates the armed services, whilst the other celebrates the lives lost. Oops! 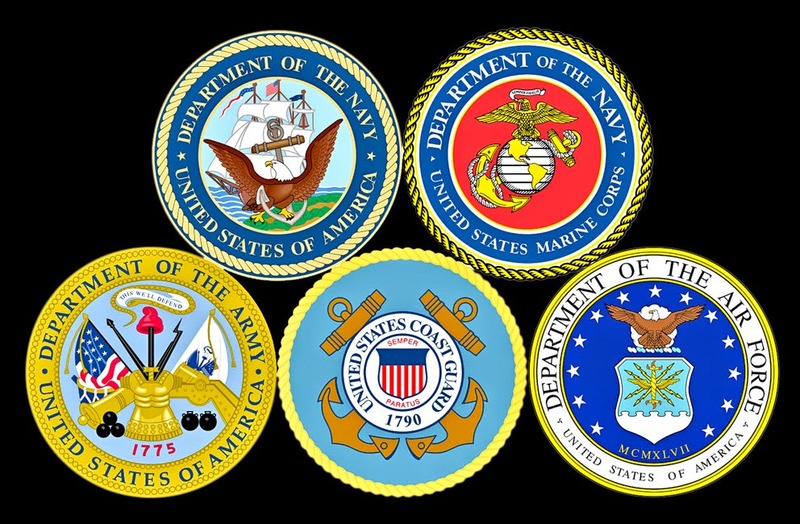 Almost the third significant holiday involving our military - Veterans Day! This year, we celebrate Veterans Day on November 11th. 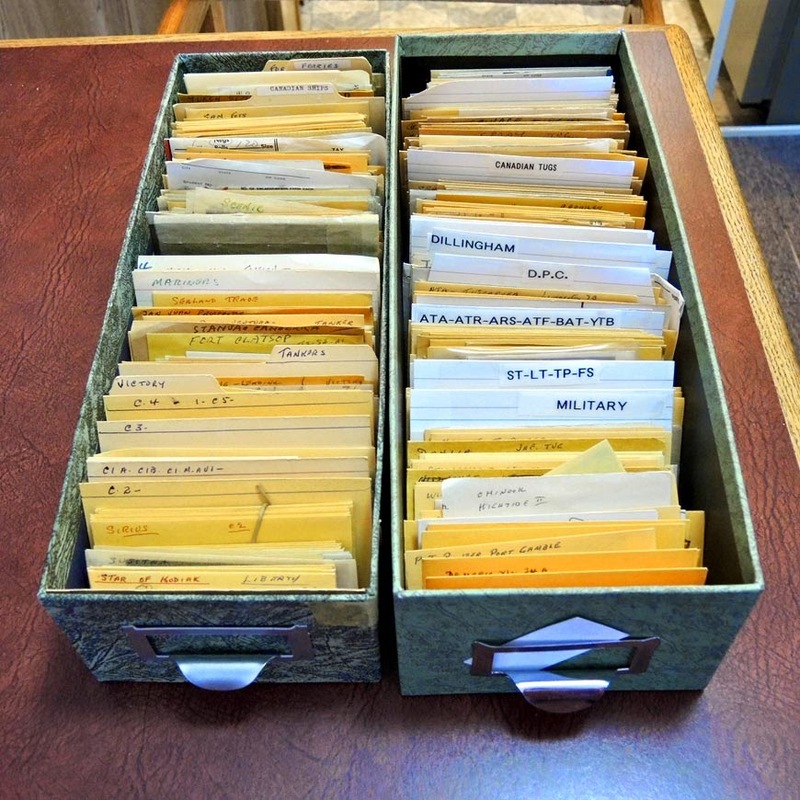 Have you noticed the almost automatic response "Thank you for your service" when interviewing or addressing veterans? Does it seem sometimes to be so automatic as to become "shallow?" If you are a vet, I'd be interested to know how you react when someone "thanks you for your service." 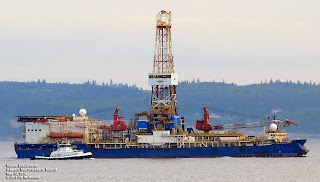 Inexplicably, at around 5 p.m. PDT (1:00 GMT), Royal Dutch Shell's leased drill ship Noble Discoverer did a complete 180° course change southwest of Cape Flattery. 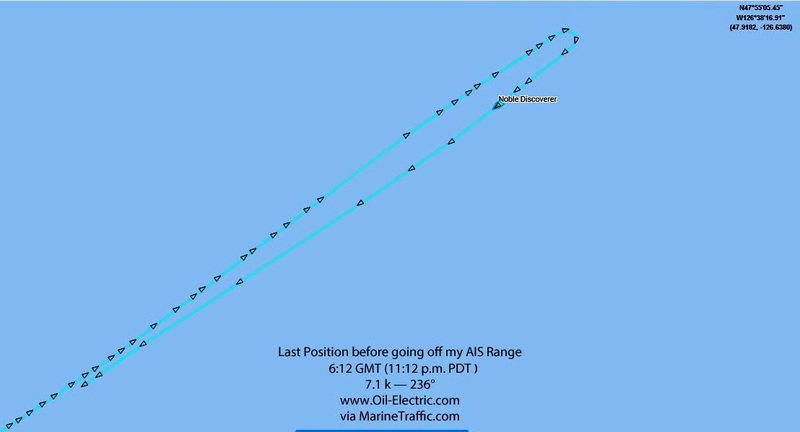 I've been tracking the vessel, hoping to get shots of her passing Point Wilson or from Marrowstone Island, as she progressed toward Everett. 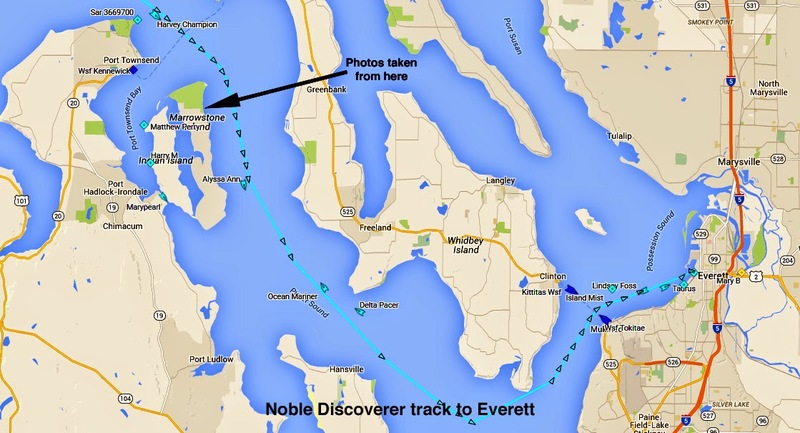 She had been making ~7k (~8 mph) on 055° completing her voyage from Singapore to Everett Washington sometime Sunday the 10th. 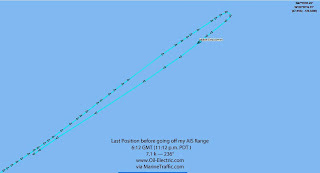 But now, some 6 hours later, she is firmly on reciprocal 235°, as reported by MarineTraffic AIS. 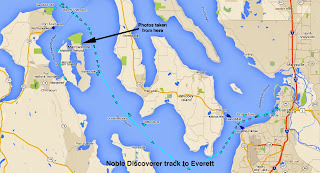 It will take some digging around to find out the reason for the turn-about, but I am speculating that the reason she is being diverted to an undisclosed location, is the tension between the Mayor, City Council of Seattle, and fever pitch resistance by environmental groups with the Port of Seattle Commissioners over the proposed alleged misuse of Terminal 5 (T-5) on Elliott Bay. 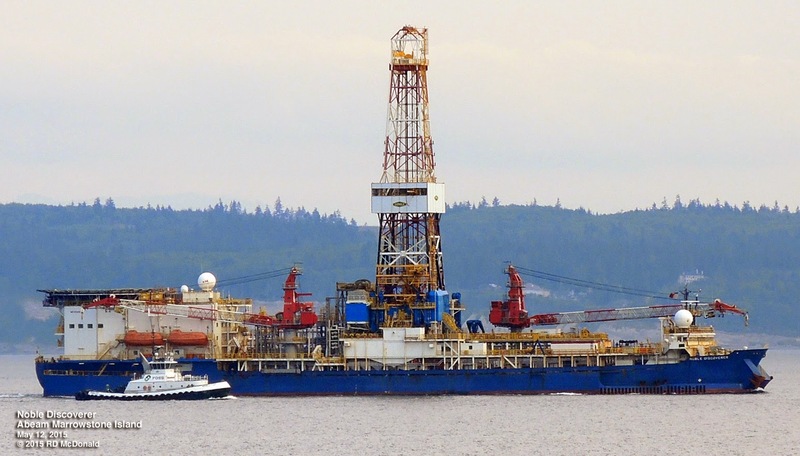 Foss Maritime intends to park the Noble Discoverer, semi-submersible Polar Pioneer, along with AHST Aiviq and other support vessels, outfitting them at T-5 for the summer drilling season in the Chukchi Sea. 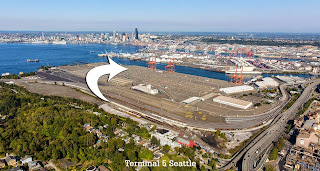 Last week, the Mayor announced that he will demand a new environmental impact plan be submitted by Foss for terminal ship repair and servicing facilities. 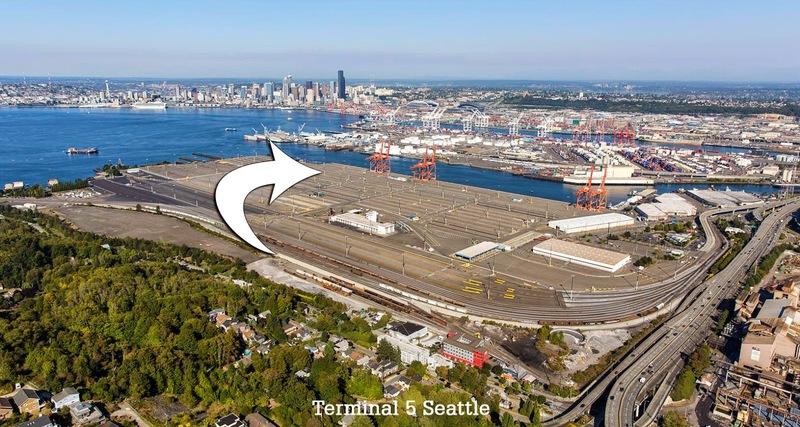 T-5 has a use permit for a container facility, going back to the days of SeaLand and subsequent occupants. The Terminal has been empty for some time. 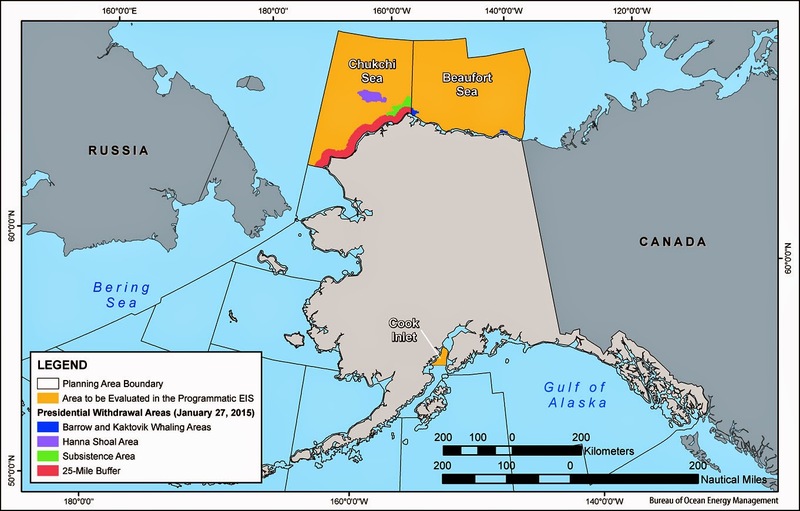 The Port Commission, three of five members accepting campaign funds from Saltchuk, parent company for a number of marine entities - including Foss Maritime, approved a lease with Foss for the Shell Arctic Drilling Expeditionary Force. 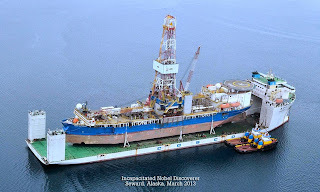 Type "Noble Discover" into my Google Search engine to read the many articles written about the debacle in the winter of 2012 with that vessel, along with the Aiviq and Kulluk. 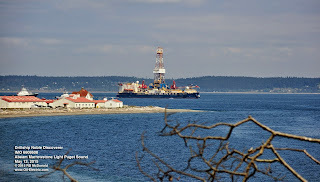 The Polar Pioneer remains in Port Angeles. 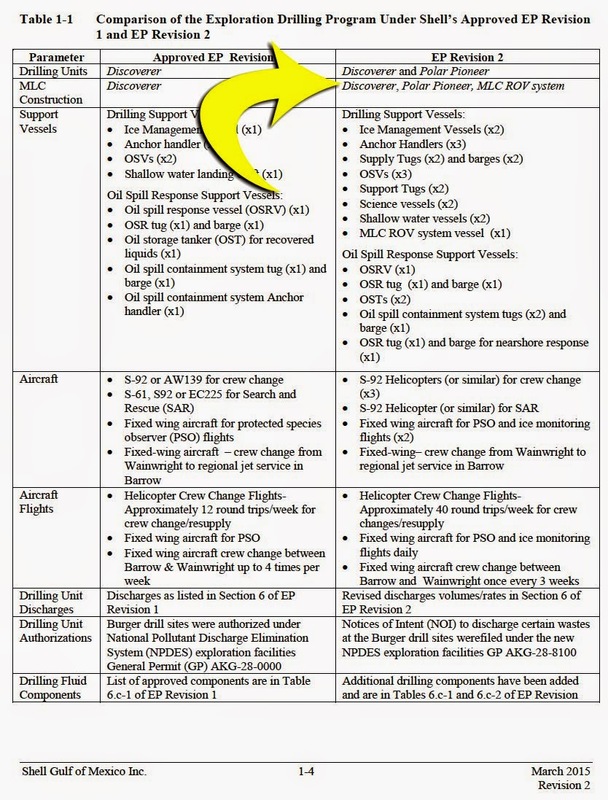 She was supposed to be towed to T5 in the near future. It is not clear what this evenings event will have on that schedule. 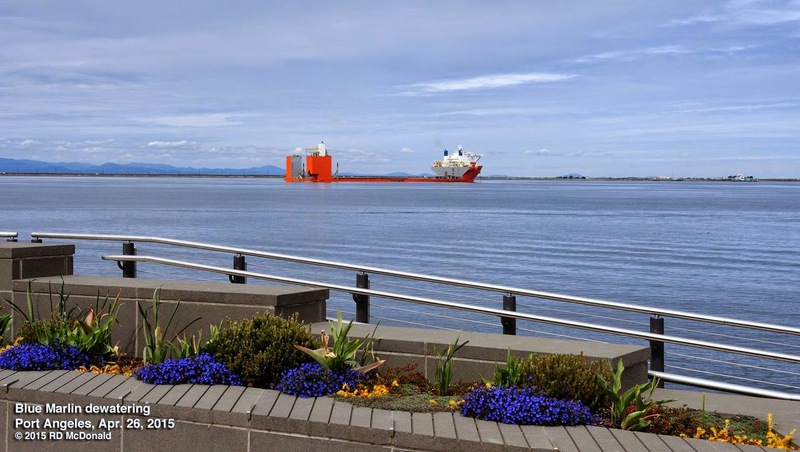 The Esplanade is where I shot the "flower pot" views.